Miraculous tales of Ladybug and Cat Noir is the best bloody show on the planet! Everything about it is amazing from the characters to the story to the animation. I’m so freaking obsessed with this show, I’ve seen every episode like seven times. If you have a favourite show, I can guarantee that you’ll ditch it if you start watching this. The days of boy superheroes are over! Miraculous is a show that focuses on girl power, and has become an international hit. The story is about two teenagers, Marinette and Adrien, that turn into the superheroes Ladybug and Cat Noir with the help of their magical pets called kwamis. They work together to save Paris from the evil Hawkmoth who turns ordinary butterflies into creatures called Akumas, that make people become villains. Here’s the catch though, they don’t know each other’s secret identities, so while Marinette has a crush on Adrien in their normal life, Cat Noir has a crush on Ladybug. This causes some pretty hilarious interactions between them, and the perfect show for fans who love shipping characters. The episodes aren’t in any particular order, you just sort of figure out the story as you watch them. If you haven’t yet seen this show but you’re considering it, here’s what’s probably going to go through your head as you get into it. Watch one episode: This show is weird, and why does she do that dance when she transforms? Well, maybe if I watch another one it won’t be as strange. Watch another episode: This show isn’t actually that bad. It’s kinda funny and I like the pet things. Watch a third episode: I’m addicted. I promise that this show will not disappoint you. The graphics are stunning! The animation literally looks like a Disney Pixar movie. I don’t know how many animators it takes to do this show but you just wanna screenshot every scene and make it your desktop background. I freaking love the characters in this show! Marinette is sweet, kind and always eager to help others. She dreams of becoming a fashion designer and also winning the heart of her crush Adrien. She’s really funny because she try’s to pluck up the courage to talk to him, but freaks out and starts stammering and gets really clumsy. Well, at least clumsier than usual. Her kwami Tikki is so damn adorable, and she’s really smart, supportive and gives a lot of helpful advice. As opposed to Adrien’s kwami Plagg, who is grouchy and lazy. All he really does is eat cheese and make sarcastic remarks. Adrien is charismatic and a little shy. His dad is stinking rich and he’s got a bedroom the size of two story house, but he never had a normal life or any friends to talk to. All his spare time was filled with private lessons and photo shoots. The alter egos of these characters are so different from their normal selves, you forget their the same people. When Marinette becomes Ladybug, she’s confident and clever, rising to a challenge with her powers of creation and good luck. Adrien’s transformation into Cat Noir, means he can let go and say whatever comes to mind, making him outgoing with a wacky and somewhat dry sense of humour. He’s completely infatuated with Ladybug and is constantly trying to impress her, with little or no success. Do I recommend this show? Yes I do. It may seem weird at first but it’s totally worth your time. If you’re new to the show, read this next bit for all the stuff you need to know to help you understand what’s going on. Akumas: Akumas are white butterflies that are turned evil by the villain Hawkmoth. They fly to a person who’s feeling angry or sad and lands on an object that they’re holding or wearing. The person’s face goes red and a butterfly shaped outline, appears in front of their face. Hawkmoth gives the person powers and turns the into a villain of that he controls. The object containing the Akuma needs to be broken in order to release it. Ladybug needs to catch the Akuma in her yo yo to cleanse it of evil and turn it back into a normal butterfly. If she doesn’t, it will multiply and all the others will turn random people into frozen copies of the villain. The original Akuma will fly back to Hawkmoth and wait for the original villain to feel negative emotions again, so they can once again be controlled by Hawkmoth. The frozen victims will come alive and work under the control of the original villain. If that made no sense, just watch the show. Tikki: Tikki is Marinette’s kwami. A kwami is a small sprite like creature that grants powers by going into a miraculous. Tikki is optimistic, supportive and is always ready to jump into action to fight a bad guy. She resembles a ladybug being red with large black spots and antenna. She levitates, and goes intangible so she can move through solid objects. To regain her strength, she likes to munch on cookies. Plagg: Plagg is the exact opposite of Tikki. He’s lazy and stubborn and does nothing but eat. He claims to have delicate taste and only eats stinky Camembert cheese. Plagg gives very little useful advice and sometimes Adrien needs to bribe him just to transform. He resembles a black cat, with ears, a tail,mane cat like eyes. Yes, there is the odd occasion where he’s not holding cheese. I did my best to find them. Miraculous: A miraculous is a magic piece of jewellery that turns a person into a superhero when their kwami flies into it. After the hero has used their power, they have five minutes before they change back to normal. 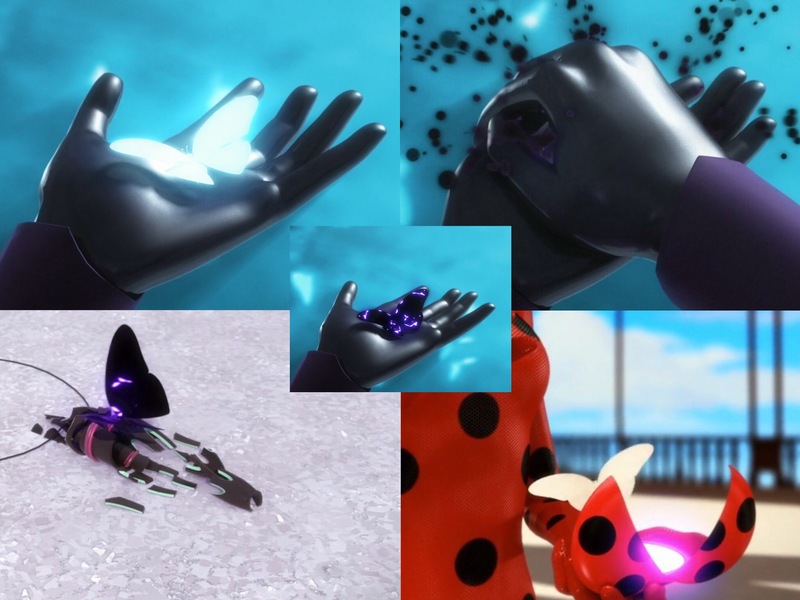 Miraculous stones aren’t meant to be used for evil, but that doesn’t stop Hawkmoth from using his to create super villains. Yes, Hawkmoth has a miraculous, and a kwami. Don’t worry though, the kwami isn’t evil, Hawkmoth just forces him to transform. If you don’t want a miraculous, your kwami will disappear when you take it off, however if you take it off by accident, your kwami will stay. Ladybug has earrings, Cat Noir has a ring, Hawkmoth has a brooch and Master Fu has a charm bracelet. Who’s Master Fu? Watch the show. That’s enough to get you started, I don’t want to spoil it for you. Now go get addicted to Miraculous Ladybug!